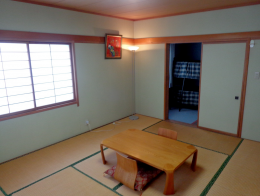 This room is a large 10 mat tatami room with Japanese style bedding and great views over the village. There is an adjacent sitting area with bunks. 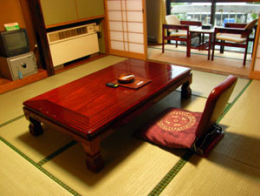 This room is a large 10 mat tatami room with a king western bed. There is an adjacent sitting area with bunks. Extra futons are available. This room is a comfortable 8 mat tatami room with Japanese style bedding and magnificent views over the village towards Madarao Kogen and Nozawa Onsen. Recommended for: Couples, small groups or family of 3-5. The combo room provides a mixture of western and Japanese style bedding. Side/street view. This room is a comfortable 8 mat tatami room with Japanese style bedding and partial mountain view. This room has three single beds and a view towards Akakura Onsen resort. Can also be configured as king bed + single. 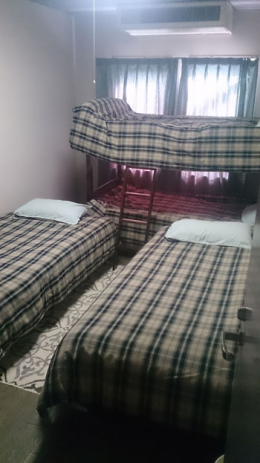 No extra beds are available. Recommended for: Couples, small groups or family of 3. 207 is our only room with full ensuite. This is a corner room with good light and views toward Akakura Onsen. It has a king bed plus an overhead bunk. An extra rollaway, futon and/or cot can be added to this room. Recommended for: Couples, small group or family of 3/4. These rooms are located in a building adjacent to the lodge (20 metres door to door). They can be booked as singles or twins. Recommended for: Individual travellers requiring privacy, couples or extra group bookings.